On a small plot in an Italian village just outside of Rome, Nonna Lina raised chickens, cows and pigs. She gardened with the time and tenderness that were the mark of her generation. And most Sundays she’d spend with her young grandson, Giulio, teaching him the ancient alchemy of flour and water. Together, they’d combine the two with care to create one of the cornerstones of Italian cuisine: pasta. Sharing her embodied wisdom came naturally. The bonds with land and food were akin to the bonds with family and community: strong, deep and built to last. The experience struck her grandson profoundly, but little did young Giulio Caperchi know he’d eventually make this way of life into his way of making a living. He never thought he’d get into the food business outright, he was seldom far from it in some form or another. After university, he took a six-month course with a Michelin-starred chef at A Tavola Con Lo Chef, a culinary institute in Rome. Summers were spent working in neighborhood trattorias, doing everything from waiting tables and cleaning dishes to helping out in the kitchen. He’d developed an interest in food policy, farming and global climate change, but always thought he’d approach it from an academic standpoint. He moved to London to pursue a master’s degree in political theory and sociology and ended up meeting Carol Sogigian—a like-minded food aficionado from Shrewsbury who was there for her master’s in marketing. But Italy kept calling: The two moved back to Rome when Giulio landed an internship with the Food and Agricultural Organization of the UN. His passion to protect farming and preserve tradition continued to grow. When Italy’s financial crisis hit, the couple moved to Boston, where Giulio ended up doing research with Frances Moore Lappé (the well-known food and democracy policy writer who wrote Diet for a Small Planet and exposed the inefficiencies of modern agriculture). Something in this experience finally tipped him from food academia into food action. In partnership with Carol—now his wife and business partner—the first iteration of Seven Hills Pasta Co. was born. They started by making taralli, a traditional wine cracker. It fared very well when they tested it at farmers markets, but was extremely labor-intensive and expensive to make. In keeping with their adventurous, resilient spirits, the couple learned, evolved and pivoted to making pasta instead. Though the fresh pasta market was saturated, there were virtually no local artisans making dried pasta. It was a perfect niche. Their pasta recipe couldn’t be simpler: Flour and water are the only two ingredients. It’s made from scratch, without preservatives, in their kitchen in Melrose. A soft dough is formed and kneaded in machines, then extruded through custom bronze dies that give it the characteristic rough texture that sauces cling to happily. 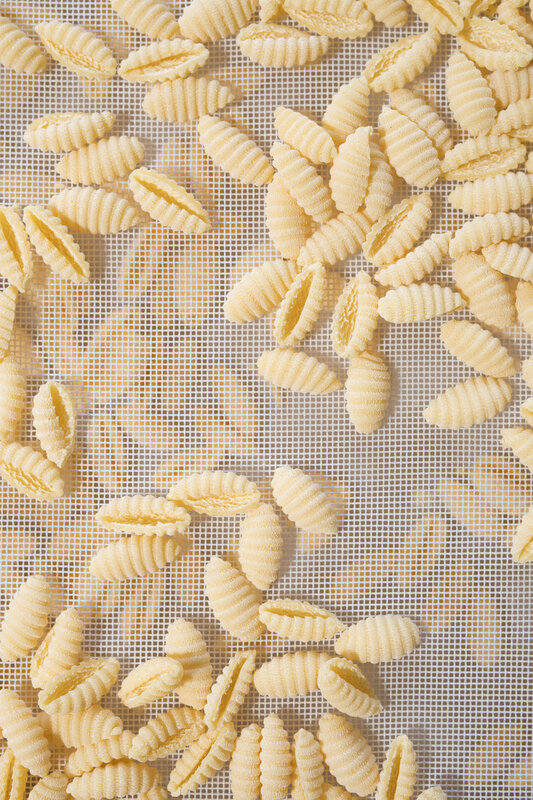 The final step involves a 24-hour air-drying period to ensure the firm al dente quality that sets good pasta apart. The machines that make the pasta also warrant a special mention. “We were in Italy in a little café once, and ended up chatting with the owner about pasta machines,” recounts Giulio. It turned out to be a fortuitous conversation. “He ended up sending us to visit a place just outside Rome that builds old-fashioned craft pasta machines complete with custom handmade bronze dies.” Imported from Italy, the machines and dryers took nearly eight months to arrive, and were so large that an entire window of their commercial kitchen had to be taken out—with police supervision—in order to get them into the building. They currently sell four shapes of pasta: casarecce, gnocchetti sardi, rigatoni and fusilli, all available at select regional retailers, at local farmers markets and through their website. In the summers, they also offer fresh sauces made from organic vegetables grown on their permaculture farm in Rutland; they’re working on a shelf-stable version and plan to stock their kitchen shop with other complementary local products. Dealing with retailers, a growing wholesale offering, farmers markets and their budding organic farm with a baby in tow is no small feat. But their attitude is positive and their spirits resilient. Because really, pasta is just the excuse. “Facciamoci Una Spaghettata!” is a proclamation on every box of Seven Hills pasta: “Let’s make a big bowl of spaghetti!” It’s a joyful call to community, an invitation to conversation, a bow to the collective experience of eating simply together and a recognition of the deepest desire that these traditions be preserved and passed on.